We are a full service Custom Printing and Embroidery Shop based in Houston, Texas. Some of our printing techniques are screen printing, dye sublimation, thermal heat transfer and digital printing. We understand how important your project is to you and we also know you have options. That’s why our goal is to bring you the highest quality printing and embroidery at an affordable price. We are committed to excellence! Our team is fully dedicated to provide you with the best customer service. Our custom t-shirt printing and embroidery services accommodate orders of all sizes, ranging from a single shirt to quantities in bulk of hundreds to thousands. Our easy to use online Design Studio enables you the flexibility to design your own customized products for groups and events. Are you looking for a fast and reliable custom printing and embroidery shop? 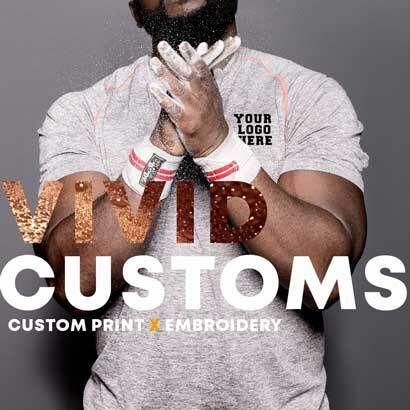 Vivid Customs is the place to go for all your custom t-shirt printing and embroidery needs. We make the custom t-shirt printing order process very easy for you! You have the flexibility of placing your order online using our Design Studio to design your t-shirt and have the order shipped directly to you or you can pick up your order in person. We do not have a minimum so you can order just 1 shirt or hundreds of shirts. Full color printing on white and colored t-shirts. Same day pick up is available. Please contact our sale representative for the availability for same day pick up. Screen printing is a printing method where a desired image/design is achieved by pushing ink using a squeegee directly onto the garment with an ink blocking stencil supported by a woven mesh screen. One color is used per screen and it is printed one color at a time. Multiple screens are needed for a full color image/design. Screen printing is very versatile. It can printed on a lot of different type of materials. It is ideal for solid color designs. However, a full color image/design can also be achieved as well. The ink in screen printing is applied thicker than digital print, therefore the print result is very bright and opaque, even on dark garments. Screen printing is also commonly known as silk printing or silkscreen printing. Screen Printing is great for bulk orders. Digital printing is a method of printing where an image/design is printed directly from a digital image onto the garment. Digital printing is a newer printing technique where high amounts of detail can be achieved where the result is more like a photographic print. The greatest difference between digital printing and screen printing is that there is no screen needed in digital printing. Because it doesn’t require screens nor physical set-up we can take orders in small quantities as little as one shirt. Embroidery has been around for a very long time. It's an ancient craft of decorating fabric or other materials using a needle to apply thread or yarn. Instead of being sewn by someone by hand, today it is done by a machine. Embroidery is great to add a company logo to business shirts, jackets, polos or hats. Monograms on towels, bags and robes are also very popular. Our embroidery department can personalize on a wide variety of garments and fabrics. There is no minimum when placing an embroidery order with us. Whether you are looking to embroidery your name on one shirt or personalize a bulk order individually we can most certainly assist you with your order! What is the difference between screen printing and digital printing? The biggest difference between screen printing and digital printing is that screen printing is a printing technique that uses one screen at a time to print each color, multiple screens are needed to achieve a full color design, whereas digital printing is printed using a computer and the design is printed directly onto the garment. Digital printing is also known as direct to garment printing, DTG. Both techniques are widely used. Screen printing is usually used for printing solid ink color designs and bulk quantities. Digital printing is more commonly used for smaller orders and orders that have high detailed designs. Which printing technique will be used on my order?